Jenna Rainey is an artist and entrepreneur with her own southern California design agency, Mon Voir. Her business specializes in illustration, watercolor, and calligraphy, for events, stationery, fabrics, and branding products. She also teaches workshops and lessons out of her agency studio and abroad. How and when did your journey as an artist begin? Did you start out in illustration or watercolor/painting? I grew up painting — my mom and both grandmothers were acrylic painters, so I grew up always around art supplies. It was always just a hobby, but that’s where I attribute where I learned to not be afraid of art supplies and to just put paint on paper. When I actually started working towards a career, I started with pointed pen calligraphy and illustration and getting hired for jobs that reflected those mediums. Watercolor came about a year into my career and I haven’t been able to look back since! I feel like we’re always changing and finding our voice whether it’s in style, relationships, careers, and with my art it’s been the same. Because I started just painting and doing calligraphy for myself and teaching myself as I went, I’m constantly learning and improving my technique and who I am as an artist. Have you always wanted to make a career out of your artistic passion? I actually went to school originally thinking I’d do music, then switched my major to psychology and wanted to be a music therapist. But I was terrible at school, so I knew I couldn’t go on for more school to become a therapist. My career as an artist was completely random. I was working at an office job at the time [and] hated it. I’d come home every night and just paint. I was teaching myself calligraphy at the time, illustrating things I just had a passion for, and eventually started posting my work on Instagram. People started hiring me, and here we are today! How and when did your journey as a business owner begin? How has your business developed? My journey as a business owner began in 2012. I had moved back to southern California from Chicago to work at a financial planning office and I really didn’t like my job, so every night after working in a cubicle, I would come home and paint. It was like my therapy and stress relief. Eventually my husband just encouraged me to start posting my work on Instagram and that’s how people started seeing my work and hiring me for little jobs like addressing envelopes in calligraphy, or doing small commissioned paintings for VERY cheap. Since then, I’ve incorporated design and custom stationery, and the opportunities and businesses I’ve been able to work with over the years has grown — I’m writing my own ‘how-to’ watercolor book that comes out this Fall with Ten Speed Press. I still get the majority of my clients and opportunities via Instagram (it’s free advertising! ), but my business has tripled within the last 6-8 months alone, and we’re working with dream clients. I now have a studio manager and assistant calligrapher as well, so I get to focus more on the illustration and design, which is what I enjoy the most about my business. You have a large following on Instagram, where you showcase and promote your work. How does your online reach contribute to your business success? It contributes in SO many ways. It’s how most of my clients find out about me/our services. The more I grow, the more opportunities [I’m] asked to be a part of… like my book deal for example, [which] came about because of Instagram/social media. It’s such a crazy world we live in, but it truly has been the best avenue for marketing and advertising for my business. I’m so grateful for being able to own a business during this time! You also offer workshops through your business, and have written a watercolor how-to book. What do you love about teaching other artists/aspiring artists? Teaching is my biggest passion. I love it. 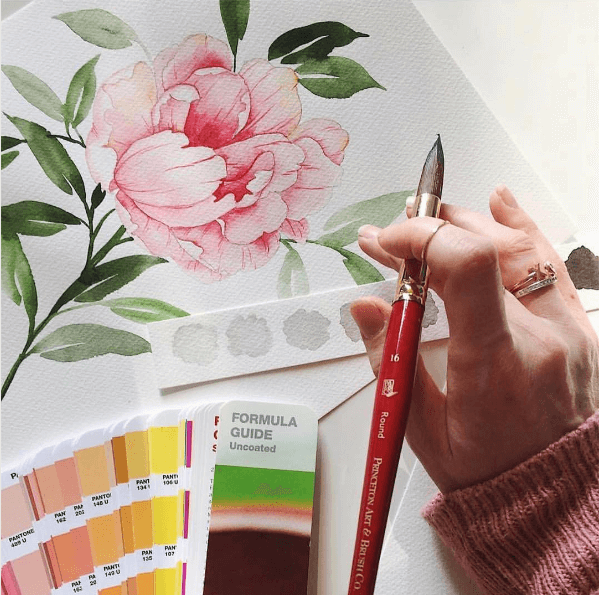 Art was something that I always did but never thought I was good at… when I came across the right materials with watercolor and calligraphy, I felt like a gift had been given to me. It changed EVERYTHING. It changed how I learned and developed as an artist; it’s transformed my style and voice, and I want to give that back to people. Everyone is created to be creative and so many people that message me or come to my workshops tell me they’re “not creative” or can’t do this or that, and I want to prove them wrong. It’s sort of like a game or challenge for me; because once I found my groove with art, it’s been so freeing and I want other people to have that. Matisse has always been an all-time favorite, along with Van Gogh; but the community of artists we have now, including designers is constantly inspiring me. 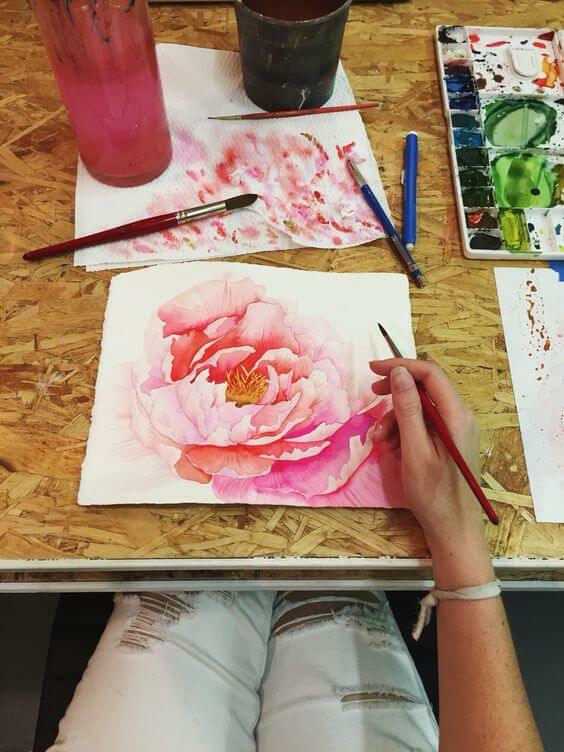 How does watercolor inspire you, and what makes it your medium of choice? I’ve tried many other mediums and nothing ever clicked with me like watercolor did. It’s just, in a way, more freeing and forgiving than others I’ve tried. It’s so easy to get lost in it when you’re watching colors blend on their own, right in front of your eyes. It’s magic! Well, this depends on what I’m working on. For custom stationery, for example, I’m usually going off of textures and imagery, specific color palettes, etc. that the client has sent over, so I usually spend some time before painting to sketch out ideas, map where I’d like watercolor to go within the set of stationery, where the calligraphy will go, what printing methods would work best for what we’re wanting to achieve, etc. Then from there, I typically pull up images of specific flowers or subjects they’re wanting included and go from there. If they’re wanting a looser style of painting, I don’t sketch beforehand, but if it’s something more realistic, with multiple layers, etc., then I’ll get my sketch down and start painting! If I’m painting for non-client work, I try to relieve myself of any and all boundaries. Because my client work usually has guides to follow like a color palette, or specific subject, etc. I try to give myself some time to just paint what comes to mind or what sounds exciting to me. I’ve been really into textiles recently, and patterns, and just watching the paint do its thing while painting simple strokes. Do you have any favorite Princeton brushes? My three favorite brushes are the Heritage series 4050, synthetic sable hair round size 2, 6, and 16. I use nothing else. I’ve been using Princeton brushes for years and having the right hair with watercolor makes all of the difference. I love the flexibility of these brushes and how they can snap back and forth between a wide stroke and a thin line. I’ve used other brands of brushes that will just flop over like a wet mop with water is applied, making it difficult to use the 2-in-1 quality of round tip brushes. No fun. These brushes are my all-time favorites.